First, not everyone can be the best. Second, most of the time the person saying you’re the best has no basis for comparison – you’re probably their only dad, mom, etc., so what do they know. Third, I happen to know some of “best” people, and believe me…they ain’t the best. Social media makes liars out of everyone. Just ask Donald Trump. But let’s talk about this past Saturday, the day before Father’s Day and all those “you’re the best” social media posts. I had a pretty great day. As a matter of fact, I’m going to say I had the best day before father’s day ever. Certainly was mine (except for one little thing which I will get to in a minute). My day started on the golf course, where I was playing like crap through the first 5 holes. 7 over par having double bogeyed 3 and 4 (not good for me). But now comes the 6th hole on the gold course at Flanders Valley. The 6th hole is a long, downhill par 3. Took out my 5 iron, hit a nice shot, watched my ball head towards the green, bounce on the front edge, roll forward and disappear into the cup. 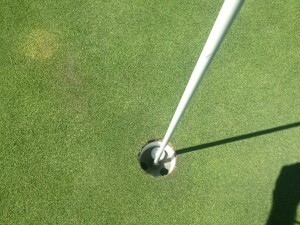 Yes, a hole-in-one! Dropped my club, put my hands on my head, and stared down in the disbelief, total shock. And yes, I have witnesses. Yup…that’s a hole in one! Of course, I followed that up with 2 more double bogeys. Than went par, birdie and 2 more double bogeys. Cursed, threw a few clubs, but in the end, I have my first (and probably only) hole-in-one. Off the course to a friends son graduation party, where they had Millburn Deli Sloppy Joes. After a tough day on the golf course, nothing like a sloppy from “The Deli” to fill you up a bit. Shower, get picked up by our friends Kevin and Denise, it’s off to the city, and a train ride to Forest Hills Stadium to see Disclosure. For those of you over 25 that don’t know who or what Disclosure is, ask your kids. For Linda and me (thanks to our kids), we have done a pretty good job of keeping up with the current music scene and they are one of our favorite bands. Actually saw them play a sold out show in The Garden, so they are pretty legit. Now for the really good parts of the night, and there was one more than one really good part of the night. Disclosure is represented by the music agent that our son Zach is working for. Our 4 tickets – comped! The show was at Forest Hills Stadium, former site of the US Open way back when. They have taken some small rooms at court level and turned them into what their version of speak-easys. If you know the password, you get in and it’s open bar, and we got the password. No charge for tickets and open bar…nice! After watching the opening acts from the comfort of our own private club, it was time for the main event. 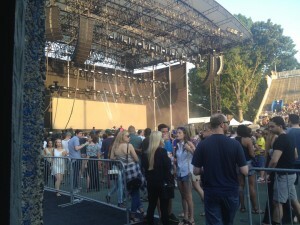 We had great seats, not that it really mattered as we stood and danced the whole show. Zach and Rebecca (his girlfriend) sat with us for part of the show. It’s so fun going to these shows, which are attended by mostly very young people, like 1/2 my age. They always engage with us and think it’s so cool that we are there with our kids. Something their parents would never do. But for me, the best part of the night was being with Zach and watching him in action. He introduced us to colleagues, we met his boss, we saw some of his old friends, and we got to see how happy he was being in his world – the world of music. I don’t think I could have asked for a better father’s day present than that. Now, the only thing missing from that was Allie. The good news is that she has had a great couple of months out in LA and I can hear in her voice how happy she is. A promotion, working on a new show at her job, which stars a former cast member of SNL (she’s such a “fangirl” as she puts it), and all seems good in LA. So I wasn’t with my kids on father’s day, but I’m OK with that. I did not see any Facebook posts telling me I’m the best dad, and I’m really OK with that. But what I’m head over heels OK with is the day I had on Saturday. Honestly, it was the best day before father’s day anyone could ask for (except for all those damn double bogeys! ).